Advanced safety features provide worry-free use! 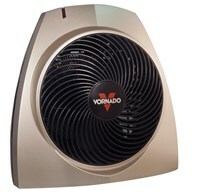 Vornado Tactile Tower Heater uses special airflow called V-Flow to heat all the air in the room, without the need for oscillation. This heater is superior to oscillating heaters which create unbalanced heat output and leave hot and cold spots in the room. Gives you simple control of the onboard thermostat to precisely dial in your comfort setting. Select from 3 fan settings, and select Auto mode to allow the fan to cycle on and off with the heating element, or continuous for constant circulation with or without heat. The air flows fast, warm and gentle with a circulation that is constant. The V-shaped pattern creates a more consistent distribution of air by passing the heat through specially contoured louvers. Provides a comfortable, whole-room heat circulation for the entire room by moving all the air- ensuring that everyone is consistently comfortable no matter where they sit. Adjustable thermostat, and advanced safety features that include safety shut-off if tipped over or if excessive heat is detected and airflow becomes obstructed. Sturdy, non-oscillating base, and an exterior that stays cool to the touch, even after hours of operation. Ideal for those who are blind or have visual impairments. 5-year warranty.